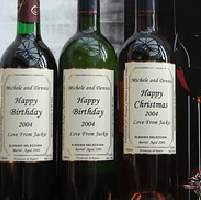 Three personalised bottles of Wine.You can add a card to the gift. Three personalised bottles of Wine. Personalise the label. You can select from red, white and rose wine to make a 3 bottle wine gift. If this is a special gift you can choose the delivery date after you checkout. One bottle of Wine Lauran Cabaret white. One bottle of Wine Lauran Cabaret red wine and One bottle of Wine Lauran Cabaret rose wine or you can mix the colour of the wine. A unique gift idea. Your message on the label of a bottle of 3 bottles of fine wine packed in a gift box and delivered by courier. Say whatever you want to say on the label, Happy Birthday, Congratulations or Thank You and the name.